This article is about the final world of Donkey Kong for the Game Boy. For the Towers found in the New Super Mario Bros. games, see Tower. 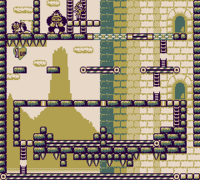 The Tower is the ninth world of the game Donkey Kong for the Game Boy. It is the final world of the game, being located in Rocky-Valley. 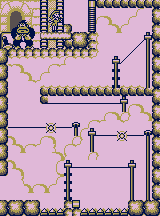 Every stage in the Tower is a boss fight against Donkey Kong or Donkey Kong Jr. Mario has to avoid many obstacles such as Poison Mushrooms and entire stages consisting of Sand Blocks. After Donkey Kong is defeated in stage 9-8, Mario has to fight him again in his giant form in stage 9-9. 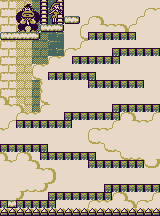 Stage 9-5 is notable for being an exact duplicate of the original, arcade version of 25m, the version of which in this game is actually missing the top two rows of girders so as to fit the stage onto one Game Boy screen. 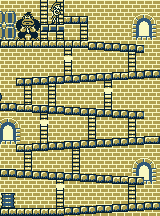 Stage 9-2 Donkey Kong, Donkey Kong Jr. Stage 9-4 Kuro, Donkey Kong, Donkey Kong Jr. This page was last edited on April 13, 2019, at 10:29.